Halloween approaches, and we take on a couple topics with the scariest thing ever…. OPINIONS! Bug and Charlie talk about their pinball dream team, and keep things to the happy side by talking games that need a second look to find the fun factor. We’ll also have another edition of Dining With Spooky at Lawrence’s Pub and Eatery with some crazy MN friends. Tack on Danni’s strategy of 2 classic games (Mata Hari and Strikes & Spares)…. James back in the E.M. Dungeon, and a super needed and cool prize from Pinball Life on a brand new product, The Bally / Stern Rectifier Board. You know yours is crispy and you need a new one, so take a shot and maybe you’ll get a free one just for listening! 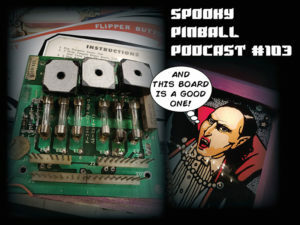 Enjoy, have fun, be nice, and absorb all the Spooky scary October goodness that is the Spooky Pinball Podcast.